Re: The Shyguy's World Best RCT3 Pics Thread! 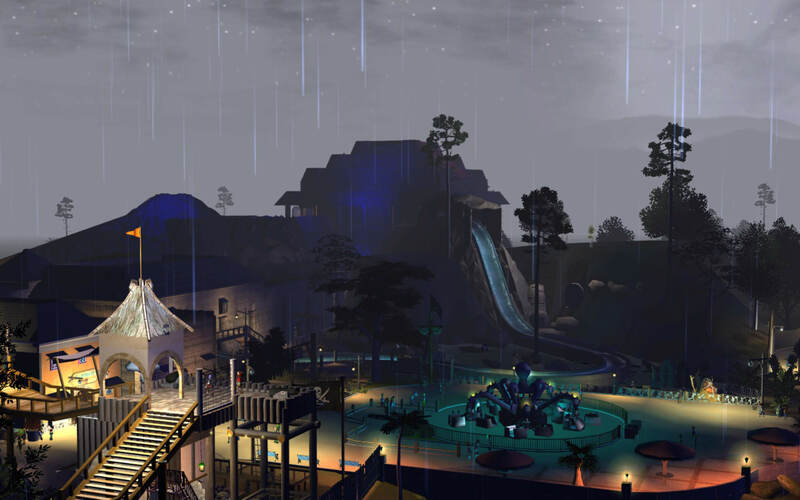 This is a slightly larger version of my Imaginarium park pic that's currently being displayed on the SGW homepage. (Yaaay!) 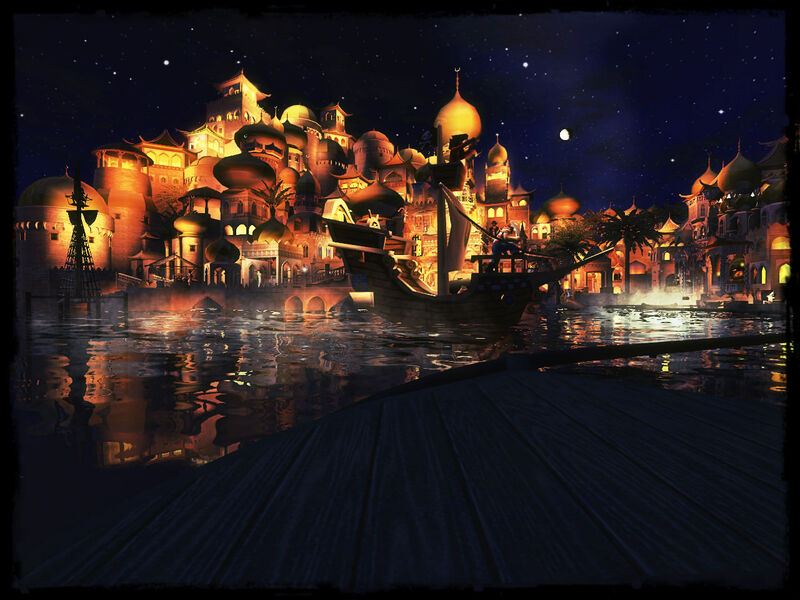 Nighttime always makes a park look magical, whether real-world or simulated. 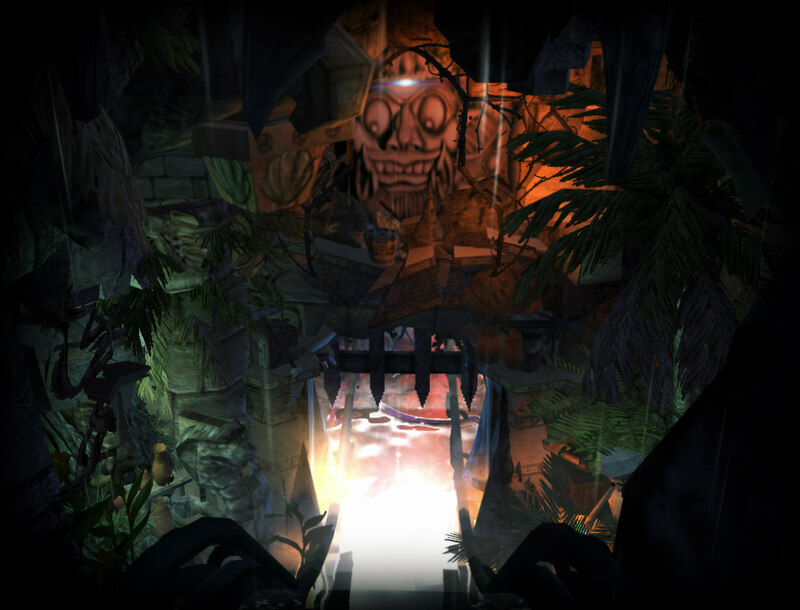 Here, as the guests make their way toward the entrance of Imaginarium they catch a glimpse of the wonders that await them. From the 10th anniversary party in Alpen-Park, summer 1980. It rained. The lord of the manor invites you to his Deathday Celebration! 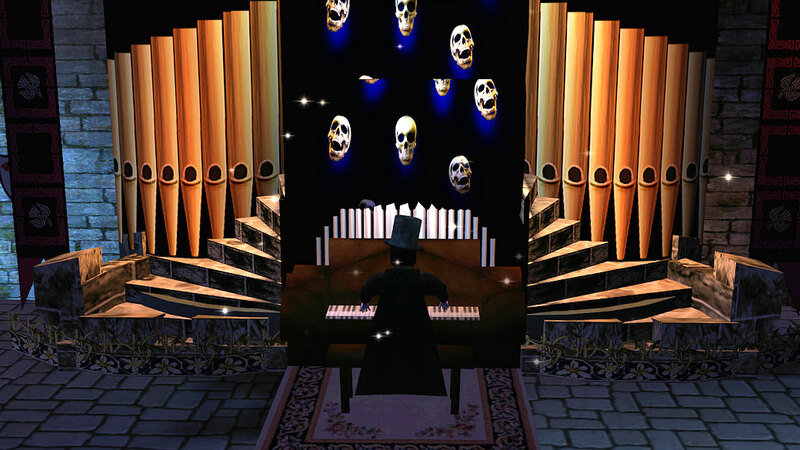 His lordship himself, will be providing the entertainment seated at his magnificent (and eerie) pipe organ. Are you in the mood for the 'Toccata And Fugue'? Join the spooky mob as they waltz the 'Danse Macabre'! Sip wine from the fountain to 'A Night On Bald Mountain'. And lift your glasses to toast the 'Grim Grinning Ghosts'! Wow! Stunning pictures from all of you guys, wish I had time to comment on all of them. JB, your pipe organ scene is ghoulishly gorgeous, with a perfect music list. Elch, I love the slightly gloomy beauty of your rain scene. I could learn a lot from you guys, not to mention the amazing Imagineer Tim! Halloween Horror Nights 28 at Universal Orlando. "Twisted Tradition" Scarezone. Absolutely incredible! I always love your work. Nice job! Love that Test Track picture! Who made this CTR? 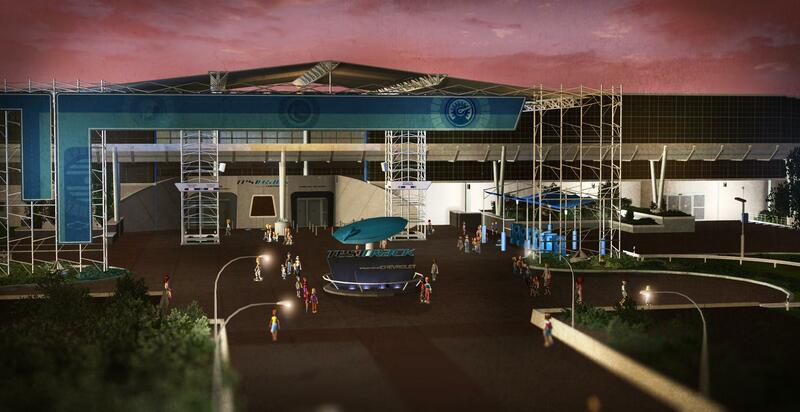 Anyway, Can you send the link of Test Track CS & CTR 2012 to Custom Scenery Depot please? 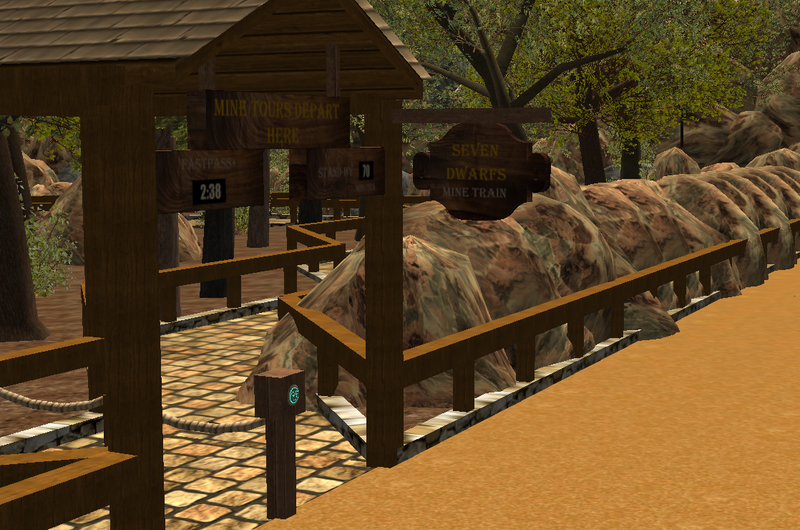 Do you have a Seven Dwarfs Mine Train CS? Do you have Test Track 2.0 CTR i can download? Magnificent! Sort of a pirate's version of what heaven would look like. So exquisite! The forest of towers glowing with golden light and reflecting on the water creates a dreamlike scene. Finally feeling confident enough with my cs making skills to continue my Test Track 2.0 ride from a while back. Love that Test Track picture! Who made this CTR? Anyway, Can you send the link of Test Track CS & CTR 2012 to Custom Scenery Depot please? And Do you have Test Track 2.0 CTR i can download? Love the 3d shots. I should try a couple of these again in my park. I love the 3D photos. Nice job! I love it too. The effect is particularly, um, effective in that last shot!